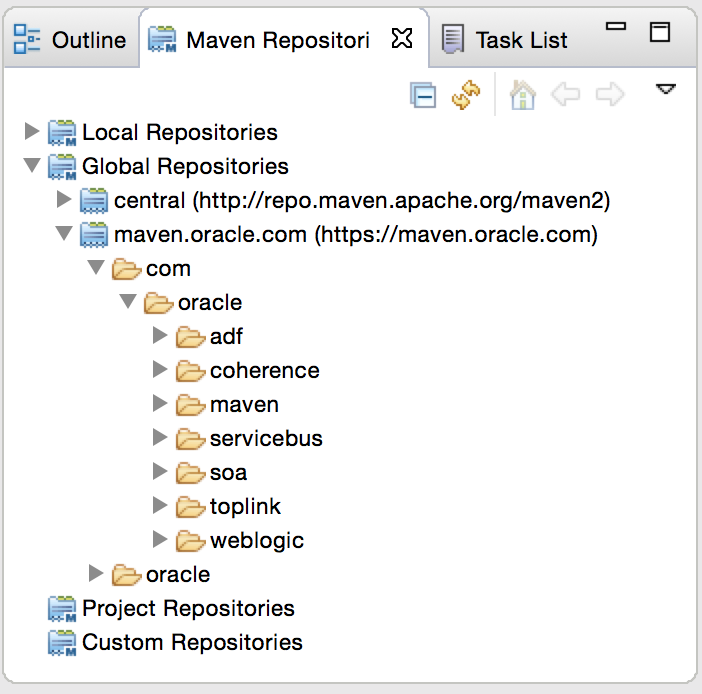 With the Oracle Maven Repository now accessible one way to have explore its contents is to use the Maven Repositories viewer feature available in most development tools. I've seen the repository contents displayed easily in NetBeans so I decided to take a look at what it looks like in Eclipse as well. I had to make a few minor setting changes to get it to work so decided to document them here. If you've gotten it to work with less setting changes, let me know! 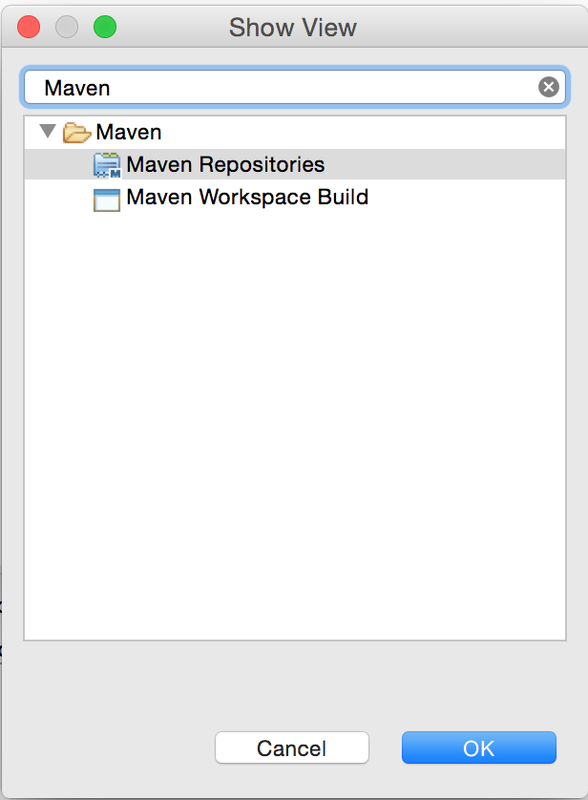 As initial setup, I configured my local maven environment to support access to the Oracle Maven Repository. This is documented here https://maven.oracle.com/doc.html. I also installed maven-3.2.5 that includes the updated Wagon module that supports authentication. 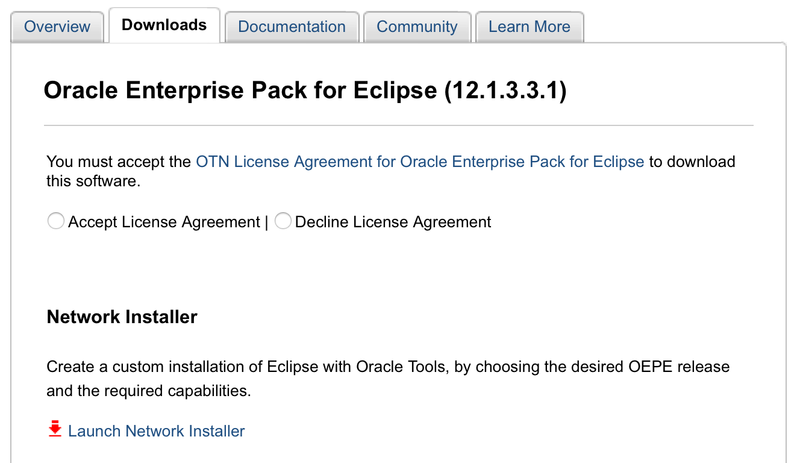 Next I downloaded and used the new network installer that the Oracle Eclipse team has published on OTN to install the latest version of Oracle Enterprise Pack for Eclipse. This network installer lets developers select the version of Eclipse to install and the set of Oracle extensions -- Weblogic, GlassFish and other stuff -- to add in to it. Once Eclipse is installed, you can add the Maven Repository viewer by selecting Window > Show View > Other > Maven Repositories from the Eclipse toolbar. With the Maven views ready to go, expand the Global Repositories node. This will show Maven Central (any other repositories you may have configured) and the Oracle Maven Repository if you have configured it correctly in the settings.xml file. The initial state of the Oracle Maven Repository doesn't show any contents indicating that its index hasn't been downloaded to display. Right mouse clicking on it and selecting the Rebuild Index option causes an error to be shown in the console output indicating that the index could not be accessed. To get it to work, I made the following changes to my environment. 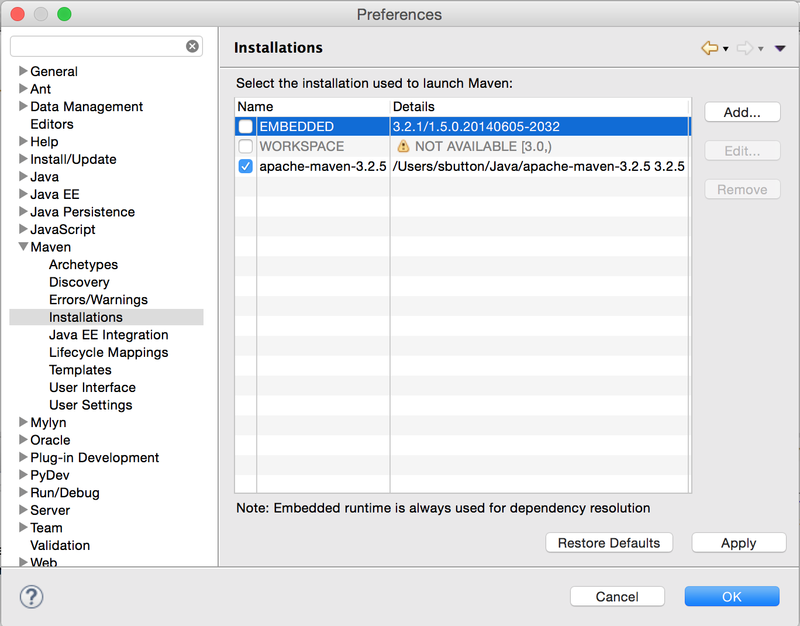 Using the Eclipse > Preferences > Maven > Installation dialog, configure Eclipse to use Maven 3.2.5. This is preferred version of Maven to use to access the Oracle Maven Repository since it automatically includes the necessary version of the Wagon HTTP module that supports the required authentication configuration and request flow. If you sit behind a firewall and need to use a proxy server to access public repositories then you need to configure a proxy setting inside the maven settings file. Interestingly for command line maven use and NetBeans a single proxy configuration in settings.xml was enough to allow the Oracle Maven Repository to be successfully accesses and its index and artifacts used. However with Eclipse, this setting alone didn't allow the Oracle Maven Repository to be accessed. Looking at the repository URL for the Oracle Maven Repository you can see ity's HTTPS based -- https://maven.oracle.com and it appears for Eclipse that a specific HTTPS based proxy setting is required for Eclipse to access HTTPS based repositories. With the settings in place, the Rebuild Index operation succeeds and the contents of the Oracle Maven Repository are displayed in the repository viewer.